I don’t remember being taught about dog bite prevention. I’m sure my parents taught me not to pull on my dogs tail, and I’m sure they told me not to ride her like a pony. And I think if I were standing on the dog to reach the sink they’d have told me to get off (yes, I’m taking about the Sarah Palin video). Yet like many others I don’t remember those lessons. What I do remember is the moment I learned to respect dogs, the moment I got bitten. Mindy and I were inseparable. I would climb all over that dog and she’d either tolerate it or move away. I’d hug her and grab her legs and she’d just sit there. That dog had patience. As children do I continued to test the limits. Teasing, poking, pulling. She took it like a saint, until the day I pulled her tail one too many times. It happened so quickly – I was in complete shock. After pulling her tail for the 7th or 8th time she finally reached around, let out a growl, and bit my hand. It didn’t break the skin, and it didn’t even hurt. But her teeth made contact with my hand – and that was scary enough. From that moment on I had a new found respect for Mindy. Before that nip I had little regard for her feelings, she was just another play thing. She taught me something valuable that day. She wasn’t just my plaything after all, she could feel pain and frustration just like me. Lesson learned Mindy, lesson learned. You can help prevent dog bites by teaching your children a few basic lessons about respecting dogs. When Laika and I go out to the park there’s one thing that I dread most – meeting children. Encountering small yappy dogs isn’t fun either, but it doesn’t fill me with the same fear that the sight of children do. Don’t get me wrong, I love children. What I don’t love is how children act around strange dogs. Children are drawn to Laika (I think it’s the big ears), and many children are amazed to be meeting a “police dog” in person. Well, no, Laika isn’t a police dog, though I’m glad you recognize the breed, and it’s nice to know you appreciate police dogs. But if you do happen to meet a real police dog one day you might want to reconsider your approach. Charging at them while squealing loudly isn’t the typical greeting for a police dog. Occasionally we meet well behaved children, ones that have either been raised with dogs or taught how to approach them. But often times this isn’t the case at all. They run, they scream, they grab her face, all within a matter of seconds. I don’t blame them, they’re kids. Meeting dogs was always exciting when I was young. When I was a kid I didn’t know that running and screaming causes a great deal of excitement and arousal in dogs. I didn’t even know there was such a thing as dog bite prevention until my dog taught me it herself. It’s scary for me when children run at my dog, poke her, hug her, and grab her tail. I know my dog, but I don’t know her that well. I don’t think she’ll ever bite a child, but how can anyone know for sure? You can be an expert in dog body language and still make mistakes. Things can happen in an instant. Most dog bites come with a bit of warning, yet we can’t guarantee that we’ll always see the signs. Nearly 4.5 million Americans are bitten by dogs each year, half of these are children. I don’t want a child to get bitten, and I certainly don’t want it to be from my dog. Laika is claimed on my home owners insurance. She’s listed as a Shepherd mix which means I have to pay extra just to own her. When I bought my home I hadn’t yet done my dog dna test, and I don’t plan on updating them with those results. It’s obvious she’s a Shepherd mix so we’re going to leave it at that. 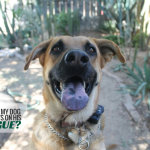 Dog bite liability laws are complex, and they vary by state, but there are a few commonalities. If my dog bites someone on my property I probably wouldn’t be taken to criminal court. But my dog would always be labeled dangerous. This can change if I lived somewhere with breed specific legislation – which the town right next to us has. If they were to find out what extra breeds my dog has (according to one dna test) I wouldn’t be getting my dog back. If the bite were to cause any sort of injury I’d likely be taken to civil court for damages. My dog might be quarantined for a period; if the injury was minor and it’s a first offense my dog will likely be returned. I understand this – and I know why these laws are in place. I’m completely fine with someone being compensated (reasonably) for medical expenses due to a dog bite. I don’t see Laika biting anyone, but it’s always a possibility. Every time a child runs up to her with their arms flailing my stomach sinks. I become a nervous wreck, I don’t know how to react in all situations, and neither does my dog. I can try to control the situation, but the situation also depends on the dog and child involved. If she ever decides to respond to the yelling, poking, or grabbing by biting I’ve got a dangerous dog on my hands. A dangerous dog that happens to be a Shepherd mix. If we lived one town over she’d be banned due to one of the other breeds in her ancestry. 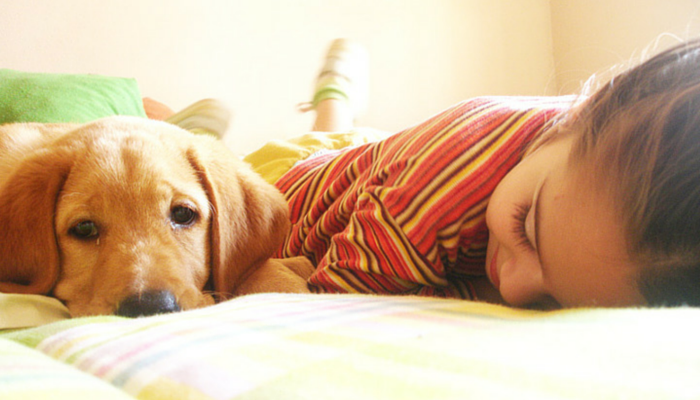 Children and dogs often share a strong bond. You can help prevent bites by teaching your child a few basic rules about respecting dogs. 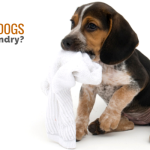 The National Canine Research Center found that responsible pet ownership is the biggest factor in preventing dog bites. Us dog owners really need to step it up and make sure our dogs are well trained, socialized, and under control. While dog owners carry most of the blame for dog bites we should also be teaching some basic dog bite prevention tips to our children. There’s a lot of great programs out there that advocate for teaching dog bite prevention to children. It’s simple and effective. Not all children are raised around dogs, which for many of us was the way we learned to respect animals. Parents are busy teaching their children a million lessons – dog bite prevention gets overlooked. It’s certainly not something I thought about until I saw how some children react around my dog. While we can’t predict every encounter our children will have with strange dogs we can set a few simple guidelines for them to follow. These 10 dog bite prevention tips are the foundation of dog bite prevention for children and adults alike. Ask permission before petting a strange dog. Always ask the dogs owner first if you can pet him. Set boundaries. Don’t interact with dogs when they’re eating, playing with a toy, caring for puppies, or sleeping. Be a tree. Dogs are excited by movement and noise. If you’re approached by a strange dog stay still. Running around or making loud noises will likely excite the dog even more. Never climb into a dogs yard. Don’t climb a fence to enter a dog’s yard. Don’t hug, poke, or grab a dog. 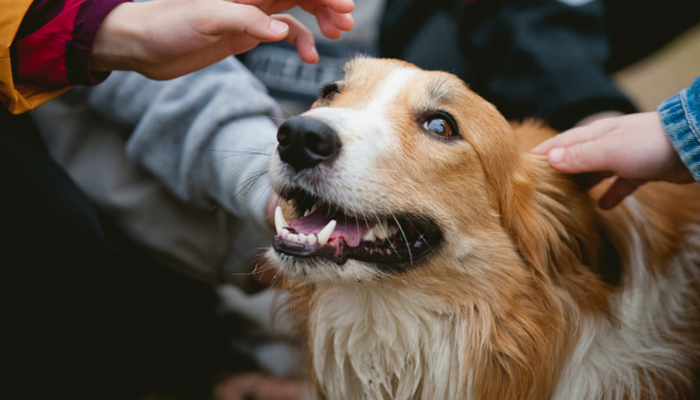 When petting a dog be calm and gentle, avoid hugging them and getting close to their face. Don’t pull on a dogs ears, fur, or tail. Be gentle and polite with dogs, some dogs won’t tolerate being poked and pulled on. Don’t climb on dogs. Respect a dogs space, don’t climb on their back or step on them. Don’t pet dogs behind fences or in cars. 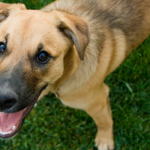 Avoid reaching out to pet any dog that’s contained behind a fence or in a car. Don’t approach loose dogs. When you see a loose dog and no owner in sight don’t approach or try to catch him. Don’t escalate situations by running, yelling or jumping at dogs. You can grab this free poster from Sophia Yin’s website. It’s a wonderful illustration on the body language of fear, and an easy way to teach dog bite prevention to kids. 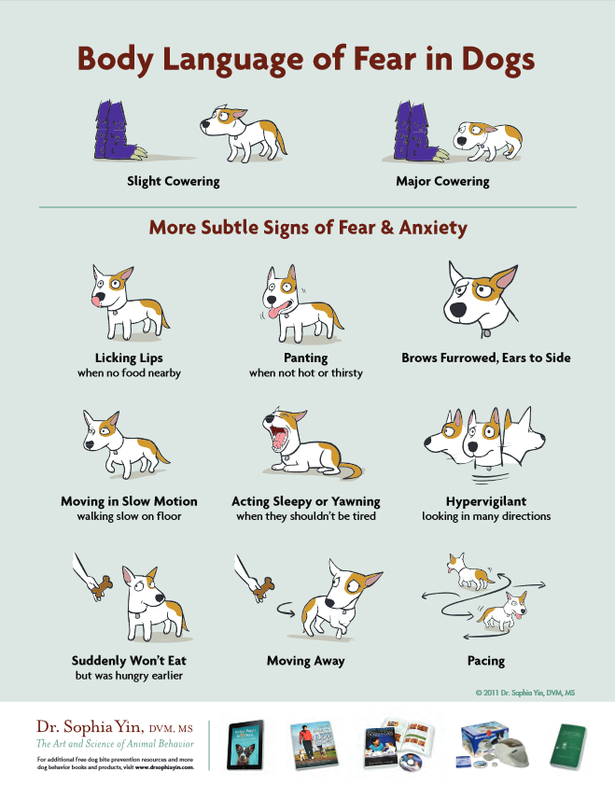 You can grab this free poster that clearly illustrates fear and anxious dog body language. It’s available on Dr. Sophia Yin’s website. 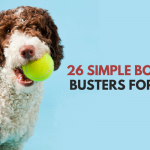 There’s a ton of great resources out there teaching dog bite prevention to kids, from printable posters to quick tip sheets. 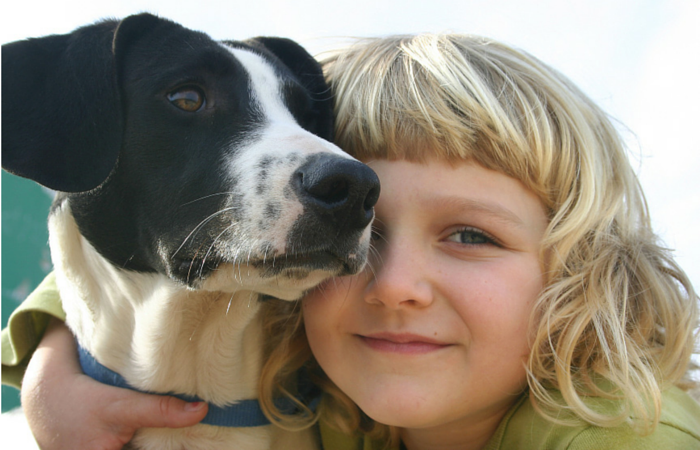 We can help protect our children by discussing with them the proper way to act around dogs. We can do our best to teach our dogs to behave well around children, but accidents will happen. Let’s help protect our kids by teaching them to respect animals before they learn it the way I did – with a bite. Wow, this is a fabulous, so important, post! That story you shared about when you were a child was fantastic…not because you got bit of course, but because things like this happen every day, and people can really learn from this. I get so angry when I see photos or videos all over the web of kids stepping on their dogs, or those posts where you read “my dog would NEVER bite my child, she/he can jump all over him, pull his ears and everything, but our dog still loves him/her.” Yea…..a dog can only tolerate so much, and then the stories get worse to the point where your reading about it on the news. “Dog gets euthanized due to biting child.” So so very sad, and preventable too. I have worked very hard with my children around not just our dogs, but other peoples dogs too. Sorry for rambling, but a great subject! Thank you so much for the wonderful comment – I completely agree. We can never guarantee how our dogs will react around children all the time. It’s much safer to work on both our dogs behavior and our childrens. I’d much rather be too cautious than not prepared when it comes to something serious. This is a super important post. I was never taught dog bite prevention as a child; in fact, I’m sure most kids aren’t. I also share your fear that my beloved dog might one day bite a child – like you said, I know my dog, but I don’t know him THAT well. I have a young niece who loves dogs and is very excitable. She runs and jumps, and I just don’t think Riley “gets” what kids are. I am worried that one day the growling will turn into biting! You shared some great tips in this post – sharing! It really is nerve wracking. I’m amazed at Laika’s level of patience when it comes to children – she seems to really love them, and she certainly tolerates things better than I would have expected her to. But there’s always that possibility. Great post, lots of great information. Pinned! Great post!!!! I can’t tell you how many times I’ve had the same feeling of dread as a child comes hurtling towards us!! I have thrown my body in front of my dog’s bodies on numerous occasions. I’ve also gotten into it with a bunch of parents when I’ve said “no, you may not pet”. Apparently I’m not allowed to take my dogs anywhere because they don’t want to be some kid’s petting zoo. It can be extremely frustrating at times! This is such an important and informative post. So many bite incidents could be prevented if both the dog owners and parents work on training. I can’t even count how many times very young children have come running, screaming or squealing towards Haley when we’ve been out walking and the child’s parents are 20 feet away. There have even been a few that poked her with sticks or hit her, yikes! One thing I learned is to be Haley’s protector. I physically put myself between her and the child so she doesn’t feel like she has to handle the situation. I also keep overly energetic kids from getting too close, even if it feels like I’m being rude in not allowing the child to pet Haley. Excellent information. When I was a kid we were just left to play with the dogs that we knew. Might be our dog or might be a friend’s. No one worried about being sued and if the dog bit you, that was your problem. It really was a much different world. I normally like to educate kids if it’s possible, so I felt bad I couldn’t explain to them nicely why they couldn’t pet the dogs. But safety comes first. I’m glad they at least asked first. This post is fantastic! How I wish more parents would teach their children – from the very start – how to safely approach and interact with dogs. I adore my sweet dog JJ – a Doberman/German Shepherd mix, and though I’d love to say “he’d never bite anyone, he is so sweet” – the fact is, I can’t know that. He’s the sweetest dog ever – but what IF? What if some child came charging at him and he was scared? Talk about every loving, responsible dog-owner’s nightmare! Anyway – this is such a great post – thank you for spreading the word of this important topic! Thank so much for the kind words; I feel the same way about my own dog. She has always been great around kids but there’s always the what if’s running through my mind. Great post! This is very important information, and I really like how you presented the material in an easy-to-read format. 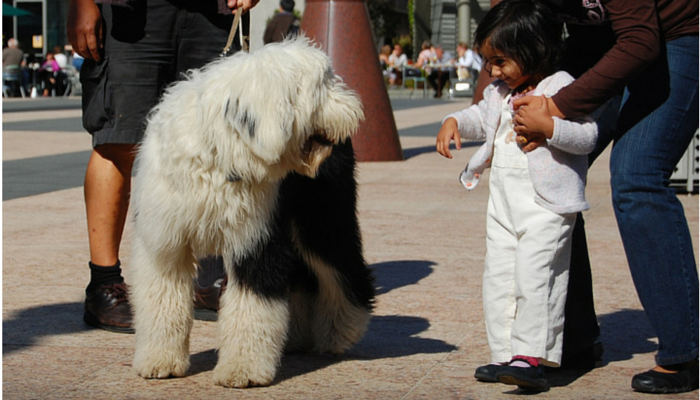 It is vital to teach respect for dogs (and all animals, really) from an early age. Thank you for sharing your story and information! This is such important information! Like you, I learned the hard way, although I was an adult in college. I hugged our family dog goodbye when I was leaving for my sophomore year, with my face right up next to hers, and because she was old and arthritic, she snapped at me, breaking the skin just barely on my nose. I knew that it was my fault and I am so cautious now about getting close to dog’s faces – even those I know. This was an excellent post. Thank you so much! In general, we have had good luck with children who approach Luna. Most of the time they are cautious and ask permission. Unfortunately that isn’t always the case. Earlier this month when we were doing our Easter Egg Hunt, a mother and daughter walked into the public grass area we were in. The daughter was practically dragging this white teacup dog with a retractable leash. I wasn’t a fan of how this 5 year old was handling the leash, but I decided not to speak up. I continued setting out the Easter Eggs, while my boyfriend held Luna’s leash. Luna was already showing signs of distress at the child and other dog. All of a sudden the little girl sprinted full force while yelling (and dragging the little dog) towards Luna. I saw a disaster about to happen. Thank goodness my boyfriend handle it like a champ and deflected the little girl. It’s so scary when you’re in that situation – and it’s a delicate balance when you’re dealing with someone else’s children. Luckily I haven’t had any parents cause any problems as I try to gently correct their kids but it always makes me a nervous wreck. Mindy sounds like a great dog. 🙂 I didn’t have dogs around much as a chid, but always cats. I learned bite prevention from them (why do kids have the need to pull tails? The poor animals!). Not everyone has access to online reading, nor any knowledgable resource regarding bite prevention, sadly. Probably wouldn’t hurt for teachers to touch on it in pre-K/kindergarten, along with looking both ways at the crosswalk. Far too many kids are getting bitten. Thank you for advancing the cause. I agree that teachers in school could touch on the subject. I certainly wouldn’t want to give them anything else to do but since there’s a lot of great resources already available I’d imagine it wouldn’t be too difficult to add in as a lesson. Children charging like that always makes my heart stop – I certainly don’t expect Laika would ever bite either but given the sudden shock and stress of it I’ll never know for sure. SUCH an important topic, and one so many parents need to understand so they can properly teach their children. Definitely sharing this on my social media! Thanks so much; before I researched the topic I didn’t realize how many children are getting bit by a familiar dog, it’s quite alarming. This needs to be read, shared, and reshared – such an important topic and you did a fantastic job with it. I am sharing now. Thank you so much, I think it’s one of those topics just that’s often overlooked. This is a great article. The tips and the explanation of being aware of the pet body language is so important. Thanks for writing such a great article. When a family dog bites a small child it isn’t always a case of a bad dog, but rather poor supervision. And of course if a dog is hurt, scared or confused it would be more likely to snap. When my dog Daisy was about 3 years old, my husband’s niece came to visit. She tried to hug Daisy and Daisy snapped at her. It was scary for all of us. I worried about how she would be when we had kids, but because I supervised her and my kids closely, there were no problems. Very nice article. Always good to remember our dogs don’t think like us — at all! I’ve found this article to be a good reminder as well; always be an advocate for our animals, even if it feels silly or rude.